Supporting renewable energy efforts and metals beneficiation, two Industrial Development Corporation-funded Coega Development Zone projects will also create some 500 job opportunities for locals. Two Industrial Development Corporation-funded projects with a combined investment of R700-million, in the Coega Industrial Development Zone (IDZ), will start operating by the end of March this year. Minister of Trade and Industry Rob Davies and Minister of Energy Ben Martins were at the Coega IDZ in Port Elizabeth on Sunday, 9 March, to mark the commissioning of the DCD Wind Towers factory and Agni Steels SA, the first steel mill in the city. The wind tower manufacturing facility is a joint initiative between DCD Group, the Industrial Development Corporation (IDC) and the Coega Development Corporation, which manages the Coega IDZ. The Industrial Development Corporation (IDC) has a 10% stake in Agni Steel SA with Agni Steels India claiming the rest. The two projects are expected to create more than 500 sustainable operational jobs. 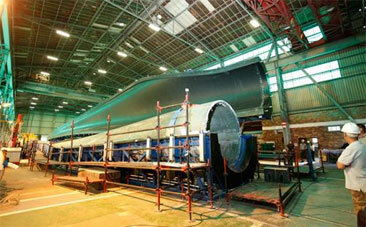 Construction on the R300-million DCD wind turbine facility started in May 2013 in Zone 3, at the Coega IDZ. The facility is expected to create almost 200 operational jobs and produce between 110 and 120 wind towers a year. During construction, the project created more than 250 temporary jobs, with the majority of the workers from local areas. Once fully operational, the manufacturing facility will focus solely on producing complete tubular steel towers, which involves manufacturing the round steel tower sections from flat steel, welding flanges to these and assembling the inner parts of the towers. The wind turbine towers will be between 80 and 120 meters tall, with individual sections weighing between 40 and 60 tons. The factory being close to the wind farms in the Eastern Cape will substantially reduce transport costs. R85-million in exploring the renewable energy market in the country. Martins said renewable energy sources like the wind towers manufactured at DCD offer South Africa and the world “an opportunity to improve the energy mix by diversifying energy sources, which ultimately improves energy security”. “Most importantly, because renewable energy sources are spread across the country and the entire world, it is safe to say renewable energy sources also contribute towards reducing dependency on imports, be it coal or oil and gas from other regions locally, or even other countries. “Deploying renewable energy sources is therefore a win-win for all because no region or country has a monopoly over these resources,” he said.